The work provides a new approach to designing complex life-like properties in non-living materials. 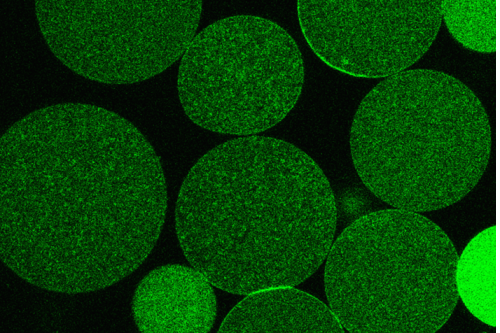 Protocells are artificial cell-like entities that could be used to clean up pollutants, store and release drugs, monitor chemical reactions, and serve as models for the origin of life. Previously, most studies on synthetic protocells have focused on the chemical assembly of individual protocells, but the idea that different types of protocells could be brought together into a community of life-like small objects has not been investigated in any detail. In a new study published today in Nature Chemistry, Professor Stephen Mann from Bristol’s School of Chemistry, together with colleagues Yan Qiao, Mei Li and Richard Booth in the Bristol Centre for Protolife Research have addressed this challenge by designing two different types of protocells, that when mixed together, produce a community that exhibits a simple form of predatory behaviour. One of the protocell populations is in the form of small liquid micro-droplets that contain a protease enzyme that breaks up protein molecules. This is the predator or killer protocell. The other member of the community is a larger protocell called a “proteinosome” that consists of a protein-polymer membrane and has molecules such as different types of DNA trapped inside it. By engineering opposite electrical charges on the different types of protocell, the team was able to show that mixing the two populations resulted in their chemical attachment, and because the protease enzyme in the liquid micro-droplets was now in contact with the membrane of the proteinosome capsules, the latter were completely destroyed within 60 minutes. But if no protease was present inside the droplets then the two types of protocells remained intact within the community. A surprising feature of the predatory behaviour was that genetic information trapped inside the proteinosomes was transferred specifically to the killer protocells as the protein-polymer membrane was destroyed. The infected droplets were released after disassembly of the proteinosomes and then began to attack other proteinosomes such that different types of DNA were collected within the killer protocells through cycles of predation. Paper: ‘Predatory Behaviour in Synthetic Protocell Communities’, by Yan Qiao, Mei Li, Richard Booth R and Stephen Mann, published in Nature Chemistry.